Rejected / Ignored: You can move members from any of the other tabs to this tab if you wish to ignore them, or if they have refused peering. This allows you to keep the other lists clean. The mechanism for detecting bilateral peers is by by observing established TCP sessions between member peering IP addresses on port 179 using sflow. See the peering matrix documentation as setting up the peering matrix will provide all the data needed for the peering manager. NB: You must check the Peering Manager option when editing VLANs for that VLAN to be included in the peering manager. the ability to manually move a peer to the Peers or Rejected / Ignored tabs. The default peering request email template can be found at resources/views/peering-manager/peering-message.foil.php. You can skin this if you wish but it is generic enough to use as is. For testing / experimentation purposes, you can enable a test mode which, when enabled, will send all peering requests to the defined test email. 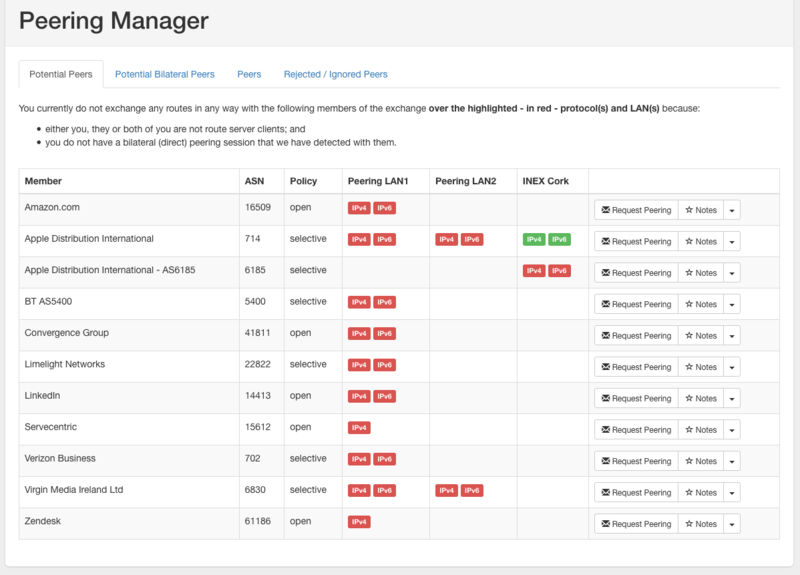 When test mode is enabled, there will be a clear alert displayed at the top of the peering manager page.